The Test tab allows you to do hypothesis testing and correlation analysis. RStat supports two types of statistical inferences, estimation and hypothesis testing. Estimation. Also referred to as predictive modeling, is the process of deriving expected and predicted values from observations. Decision trees, regression, and the other algorithms, which are located on the Model tab, are used to generate estimates. For example, you can estimate whether a prospect is a good target for a particular marketing campaign or you can estimate the expected sales revenues for different stores in order to determine whether store layout and product mix has impact on sales. Hypothesis Testing. Gives you a way of using samples to test whether or not statistical claims are likely to be true. For example, drug A is more effective than drug B, male customers spend less than female customers, the response rate to offer A is better than that of offer B, machine A produces more defects than machine B, individual expense reports from the southern region are greater than those from the western region, and so on. Analysts may want to determine if a marketing campaign is successful. They design a test group, which receives an offer, and a control group, which does not. The spending of both groups is tracked in the database. The hypothesis test will determine if the two groups differ significantly in their spending patterns. Why test? In this example, analysts want to find out if the test group spends more. If the test group spends the same as the control group, they will assume that the campaign is not successful. Rarely are the expenditures of the two groups identical, so the question arises, how different must the expenditures be in order to determine if the campaign has an effect? The test statistics indicate whether the differences are statistically significant. An image of the Test tab follows. Samples for testing can be selected in one of two ways. Select a single variable from the Sample 1 drop-down box and separate the individual samples by the target variable. This is the default method. With this method, it is assumed that the variable selected in Sample 1 contains both samples and that the samples can be differentiated by the Target variable. 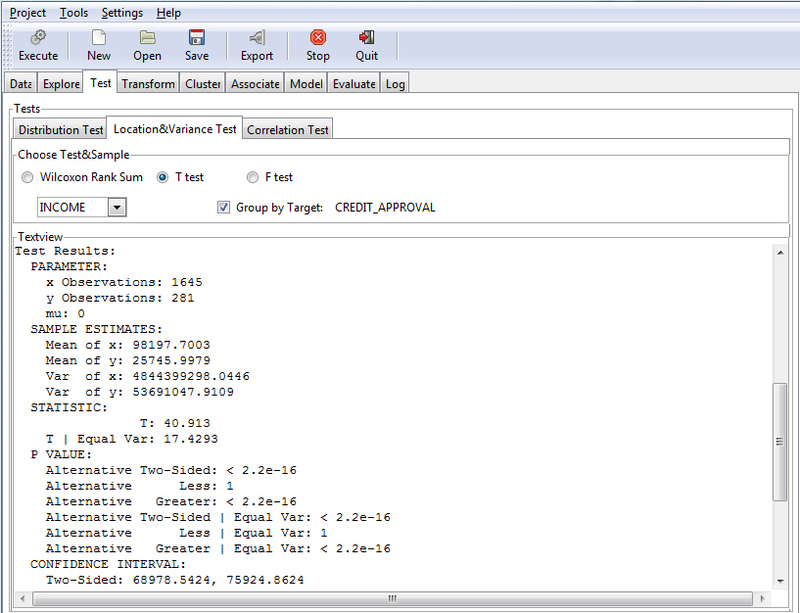 For example, the data set may contain the variable, Spend, and another variable, Test/Control Group. The second variable is used to classify the transactions in the Spend variable based on whether they are made by people who were subjected to a marketing campaign (test group) or not (control group). If the second variable is defined as a Target in the Data tab, you can run the tests to compare the two groups. Note: This method cannot be used for the Correlation and Wilcoxon Signed-Rank tests. Those options will be grayed out until the user selects the option below. The two samples are in the data set as two different variables. In other words, the data can contain the variables Spend Test Group and Spend Control Group. To select the two variables for testing, uncheck the Group by Target check box. This will make the Sample 2 drop-down box active. Select the second variable from the Sample 2 drop-down list. This method applies to all tests in the Test tab. Note: The drop-down boxes can contain only numeric variables. The following image shows an example of using a T test to identify two samples, people who have been approved for credit and those who have not, and whether their income differs significantly between the two groups. The Test tab, which contains the various tests supported by RStat, is divided into three tabs: Distribution Test, Location&Variance Test, and Correlation Test, as shown in the following image. These tabs organize the different tests into logical categories. This section reviews these tests, and introduces the Chi-SQ GUI. Distribution Test. These non-parametric tests make no assumptions that the underlying distribution is normal. They are suitable for many types of data that do not follow the normal distribution, for example, ranked and cross-tabulated data. Kolmogorov-Smirnov. The test compares the two distributions by being sensitive to both the location (mean, median, mode) and the shape (spread) of the distribution. Wilcoxon Signed Rank Test. This test differs from other distribution tests because it is used on two related samples, such as matched pairs, before and after tests, and repeated measurements on the same fields. Location&Variance Test. These tests are used to determine if there is a shift of the distribution. The non-parametric test (Wilcoxon Rank Sum) makes no assumptions that the underlying distribution is normal. They are suitable for many types of data that do not follow the normal distribution, for example, ranked and cross-tabulated data. The parametric tests (T test and F test) make strong assumptions that the underlying distribution is normal, for example, having a bell-shaped curve. Wilcoxon Rank Sum. This test, also known as the Mann-Whitney-Wilcoxon test, is analogous to the two-sample T test, but is performed on the rankings of the combined data sets instead of on the actual measure. It is based on median and non-normal distributions. If the observation rankings are not different, then the samples are not different. Because it is performed on the rankings, it is more sensitive about the location of the distribution, that is, to the median (not the mean as in the T test). T test. Is the most commonly used test to determine whether the means of two normally distributed samples are of equal sizes. It assumes that the distribution is normal. The mean is a measure of the location of the distribution. If the two populations are normal (bell-shaped curves) and their means are different, then the two bell-shaped curves will be offset from one another, indicating that the two samples are different. If the means are equal, the bell-shaped curves will overlap. F test. Is used to determine if the standard deviations of two samples are the same. It assumes that the distribution is normal. If the standard deviations are not the same, the bell-shaped curves will be different for the two samples. If the samples have the same standard deviations, then a T test can be conducted to test if the means are equal. The test is also referred to as a test on the variance of two samples and is used in analysis of variance (ANOVA). Correlation Test. Determines if there is a linear relationship between two variables. It also measures the strength and direction of the relationship. Correlation analysis does not test whether two samples are different. Only the Pearson correlation test is performed in the Test tab. Chi-SQ Test. Tests for any observed differences that exist within sets of categorical data. You can run this test from the Correlation Test tab, which is located on the Test tab. The Pearson Chi-Squared test is a statistical test that is applied to categorical data, which is organized in sets. The test evaluates the likelihood that any observed difference arose between the sets by chance. 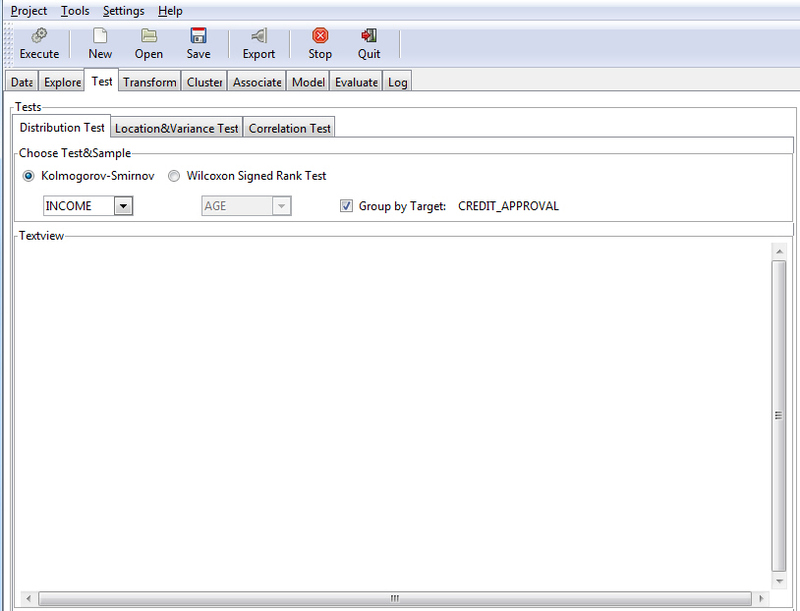 Note: To activate the Chi-SQ GUI, access the Correlation Test tab on the Test tab and click Execute. The Textview pane displays the results of your test. Once you make a selection for Goodness-of-fit Test or Independence Test, the relevant variable drop-down lists are activated. Test Type. Allows you to select a test type (Goodness-of-fit Test or Independence Test). The Goodness-of-fit Test is selected, by default. Goodness-of-fit Test. A test that establishes whether an observed frequency distribution, which is a table that displays the frequency of potential outcomes in a sample, differs from a theoretical distribution. Independence Test. A test that uses two categorical variables from a single population. The Independence test is used to determine whether a significant relationship exists between the two variables. Select Variables. Depending on the test type with which you are working, you can select one variable (Goodness-of-fit) or two variables (Independence Test). The list of available variables is based on the data set you are using. Operations. These are the functions that you can perform based on your test type and variable selections. Execute. Executes the Chi-Square test based on your selections. 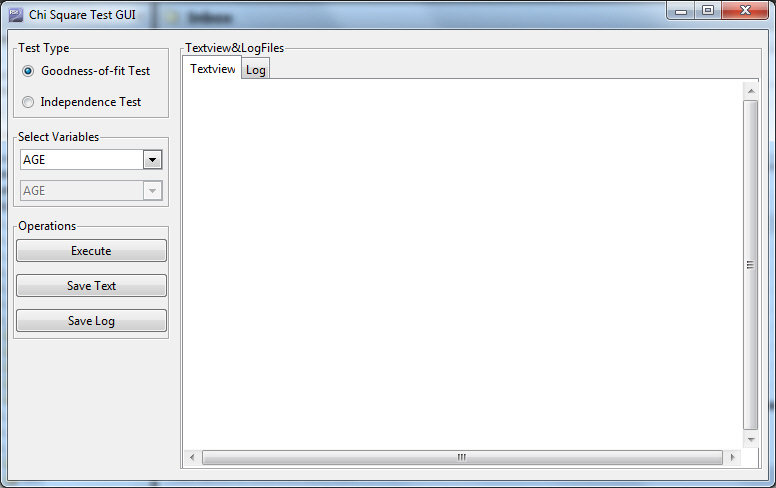 The results are displayed in the Textview dialog box, and a record of the activity is posted to the log. Save Text. Enables you to save the resulting text of your Chi-Square test to a text file on your local drive. This is useful for archival or comparative purposes. Save Log. Enables you to save the log file, which records all of the different R commands executed during the various tests, to a text file on your local drive.